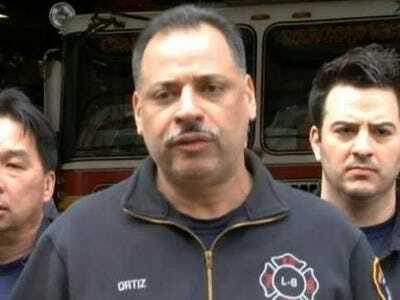 Firefighter Jose Ortiz describes how he saved a woman from being hacked to death by a man wielding a meat cleaver on a New York street. The woman was struck several times by the blade before Ortiz and associate Shane Clark were able to subdue her attacker, according to NBC New York. As they wrestled him to the ground, the woman fled into a nearby restaurant covered in blood, then bolted out into the street. Another firefighter fetched a trauma injury bag and chased her down, ultimately convincing the woman — who apparently had limited English-speaking skills — that he was just trying to help. The victim was taken to Bellevue Hospital with lacerations on her back, neck and face, but she’s expected to recover. This video is from NBC New York, aired Sunday, Feb. 24, 2013.